Spacescientists are evaluating use of Moon-based instruments to study the Earth.Lunar situated sensors at an Earth Observatory could yield distinctiveobservations of our home world, its vegetation, polar caps, as well as monitorSun/Earth interactions. Oneearly prospect is to inspect the Earth from the Moon to appraise sensitive gearand procedures helpful in spotting Earth-like planets circling other stars. PlantingEarth-looking science instruments on the Moon is not a new idea. Backin 1972, Apollo 16 was the fifth mission to land men on the Moon and returnthem back here to terra firma. 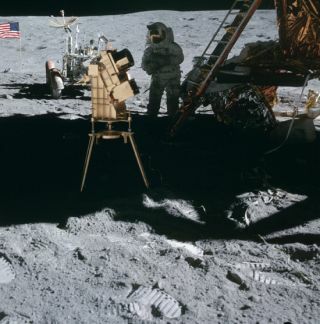 While bounding about the lunar landscape,astronauts snagged rock and soil samples, took pictures and performed researchtasks that included use of an ultraviolet camera/spectrograph - the firstastronomical and Earth observations taken from the Moon's surface. Butmore recently, a NASA Advisory Council subcommittee has taken on the task toconsider the merit of gazing at the Earth from the Moon. That review has beenspurred by the space agency's big picture plan for returning humans to the Moonby 2020 - one element of the Vision for Space Exploration set in motion by U.S.President George W. Bush in early 2004. Latelast year, a sub-panel group of the NASA Advisory Council (NAC) reviewed andconsolidated a list of Earth Science objectives that could be carried out fromthe Moon's surface. In their down-to-earth view, Moon-based spectrometers of varyingresolution operating over a wide range of wavelengths could perform valuablework. "Ageneral Earth Observatory on the Moon would be of considerable value. ThisEarth Observatory would have specific technological and energy requirements,and require significant investments in new technology, which NASA would need todetermine in consultation with the Earth Science community," the NAC studygroup reported. NACmembers are also discussing a Moon-based Earth Observatory that is Internetaccessible to the scientific community as well as the public. That Internetlink would offer a continuously monitored, hyper-spectral, single frame sightof the whole Earth. Furthermore,by making use of data fusion technology, Earth imagery from Moon could be instantlyintegrated with real-time heliophysics and aeronomical data. Potentially, thismixing of information sets could lend a hand in deciphering the complexinteractions of space phenomena with Earth weather processes. There'salso NAC member opinion about inspecting Earth's photometric signature of plantlife from the Moon. By studying the biologically altered reflected light fromthe Earth, such looks may be helpful in fine-tuning skills in the search forEarth-like, extrasolar planets. TheMoon presents a useful and stable platform for obtaining unique, simultaneousviews of the Earth and Sun explained Jay Herman, a project scientist at NASA's Goddard Space Flight Center in Greenbelt, Maryland. Still, setting upscience gear on the lunar surface, powering them, and protecting hardware fromthe Moon's vicious day/night temperature swings is no piece of cake, he told SPACE.com. Hermansaid that lunar dust is also a troublesome issue. "It's quite abrasive. Sokeeping it out of movable joints...it'll damage equipment very quickly. That's amajor problem," he advised. Thereal question in placing precision optical paraphernalia on the Moon is thedurability of that equipment, Herman suggested. Also, just how much attentionsuch gear would need from space suited moonwalkers needs to be addressed, be itfor initial deployment and setup to instrument pointing and final checkout. Engineeringaround such problems would seem doable, Herman said. Equipmenton the Moon could address the relationship between solar activity and thestructure and dynamics of Earth's atmosphere from the surface to thethermosphere-ionosphere, for a range of seasons, solar radiation and energeticparticle inputs, Herman explained. Atthe same time, Sun-scanning instruments could independently provide newinformation on the processes governing solar activity using wavelengths fromthe visible to soft x-rays. Indeed,the output from such science observations from the Moon, Herman added, could helppiece together the saga behind Sun-Earth weather relationships and long-termclimate factors. Butto get a better handle on the types of science equipment that might bestationed on the Moon, Herman suggested first installing relatively inexpensivesuitcase-sized instruments on the lunar surface. "Thatwould be sort of the first step toward seeing whether the Moon is actually asuitable place for instrumentation...say for larger telescopes," Herman said. "These would be small, economical instruments to observe the Earth or the Sun,or both."